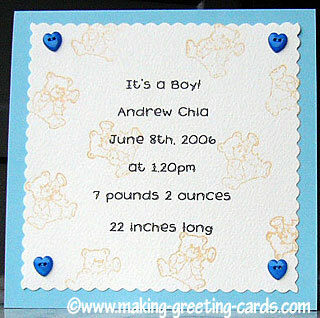 Lovely Birth Announcements to send out to relatives and friends announcing the birth of your new born. With the addition of the baby to the family, you might find yourself too busy to make and send out your own homemade new baby announcements. Notes: If you need help on how to write the words for these birth announcements, just go to Baby Cards' Verses. Tips: Just use a rose pink or sweet pastel colour theme if it's a baby girl. 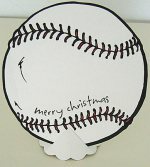 Well, a family member can always help to create these cards. Or you could do them in stages. 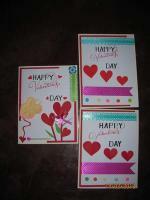 Actually, these cards are easy to create and can be done very quickly. If you want to view a bigger version of this card, just place your mouse curser on the image and click. It will open out in a new window. Use Microsoft Word to create the words. Trim on all sides with scallop blade. Ink stamp with Soft Vanilla color ink pad. Stamp the teddy bear stamp randomly over the white cardstocks. Sew the buttons onto the 4 corners with blue thread. 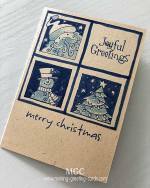 Apply double sided tape and attach to light blue blank cards. I have started a dedicated website for all things birthday. 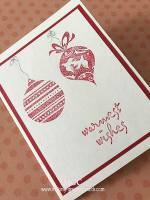 In there, you will be able to view and get printable Happy Birthday cards and announcements as well as party invitations, decorations, and party favors. Check out the birthday website.